Les Bulles bei La Chaux-de-Fonds is a Mennonite congregation in the Jura district of the cantons of Bern and Neuchatel, with a meetinghouse (built in 1894) located in the hamlet of Bulles near La Chaux de Fonds at the far western end of the Jura Mountain plateau. Until 1923 it was a part of the larger congregation called Chaux d’Abel-Chaux de Fonds, which had two meetinghouses, the second being Chaux d’Abel built in 1905. The original congregation was formed by a late 19th-century merger of the Amish and Mennonite groups living in this area, the Amish La Ferriére, the Mennonite Chaux d’Abel. The earliest settlers in this vicinity probably came from the Emmental and Thun districts of the canton of Bern in the first decades of the 18th century. In 1882 the first Bible Conference (Bibelkurs) among the Mennonites of Switzerland was held in the Chaux de Fonds area followed by regular annual sessions attended by many from the other congregations. A number of outside evangelists contributed to the spiritual awakening in the Swiss congregations at the beginning of the 20th century and served in this annual Bible conference. Among them was Georg Steinberger of Rämismühle (canton of Zürich), and after 1904 Jakob Vetter, founder of the German Tent Mission. A prominent leader of the congregation was Elder David Ummel of Chaux d’Abel (elder 1837-1896) who reached the ageof 95 years. Other elders have been A. Geiser,?-1902; Michael Nussbaumer, 1878-1917; David Ummel, 1887-1918; Heinrich Ummel, 1902-1930; and Louis Geiser, after 1935, the elder of the congregation in 1950. The 1950 membership was ca. 130 baptized, with 50 families. The congregation had a Sunday school and a chorus. Located as it is in the midst of a completely French-speaking environment and having no German school, the congregation was gradually changing its language from German to French. In 2009 the congregation had 200 members and the pastor was Daniel Bippus. Bender, Harold S. "Église évangélique mennonite Les Bulles (Les Bulles bei La Chaux-de-Fonds, Neuchâtel, Switzerland)." Global Anabaptist Mennonite Encyclopedia Online. 1953. Web. 20 Apr 2019. http://gameo.org/index.php?title=%C3%89glise_%C3%A9vang%C3%A9lique_mennonite_Les_Bulles_(Les_Bulles_bei_La_Chaux-de-Fonds,_Neuch%C3%A2tel,_Switzerland)&oldid=140657. Bender, Harold S. (1953). 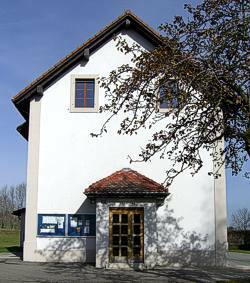 Église évangélique mennonite Les Bulles (Les Bulles bei La Chaux-de-Fonds, Neuchâtel, Switzerland). Global Anabaptist Mennonite Encyclopedia Online. Retrieved 20 April 2019, from http://gameo.org/index.php?title=%C3%89glise_%C3%A9vang%C3%A9lique_mennonite_Les_Bulles_(Les_Bulles_bei_La_Chaux-de-Fonds,_Neuch%C3%A2tel,_Switzerland)&oldid=140657. Adapted by permission of Herald Press, Harrisonburg, Virginia, from Mennonite Encyclopedia, Vol. 1, p. 467. All rights reserved.